The search for energy efficiency in institutional and commercial buildings is never-ending. For maintenance and engineering managers, the quest involves pursuing energy-conservation efforts that improve system efficiency while also reducing operating costs. An excellent place to focus on improving efficiency is to consider improved maintenance practices on boilers and water heaters, which frequently represent 60-90 percent of annual fuel consumption in facilities. It is not uncommon to see overall system efficiency between 60-80 percent with older boiler systems. Boilers and water heaters not only are large energy consumers. They are historically poor performers. By implementing energy conservation measures (ECMs) targeting boilers and water heaters, managers can improve both efficiency and savings. • radiant losses — 2 percent. 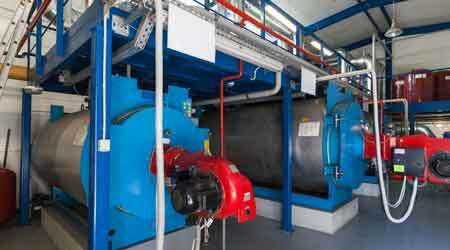 Boilers are often commissioned at the time of installation. After that, attention often fades to a bare minimum to maintain operation. This dangerous mentality prevents many technicians and operators from targeting boilers for improvements. But during normal operation, boiler efficiency degrades unless workers pay continued attention to both the water side and air side of heat transfer. On the most basic level, operators first should validate that boiler doors securely shut and that the gaskets are in good condition. Air-side considerations include monitoring the build-up of soot from products of combustion on the heat-transfer surface, either inside on fire-tube boilers or outside on water-tube boilers. Operators can estimate the relative cleanliness of this convection heat-transfer section by determining the differential pressure between the burner section and the breeching. Trending this draft loss indicates the level of cleanliness of air-side surfaces. While this film is thin, the layer of soot significantly impedes the conductive heat transfer. The typical range is a 1-3 percent increase in energy use. Water-side considerations are similar regarding the inhibition of heat transfer. As water vaporizes, steam generated is removed for heating or process work. City-supply make-up water contains impurities that do not vaporize and remain in the boiler water. These impurities build up over time, becoming total solids, which consist of suspended and dissolved solids. Suspended solids can be removed by filtrations and blowdown. Blowdown is the intentional discharge of boiler water to eliminate the build-up of impurities. Dissolved solids are impurities that remain in suspension in water. Coagulants are required to enable their removal via filtration or blowdown. Both suspended and dissolved solids inhibit heat transfer and, as a result, reduce boiler efficiency. Boiler blowdown removes these impurities, while chemical treatment can mitigate scale. A comprehensive water-treatment program can control water-side impurities. By working with a water-treatment professional, managers can improve the performance of boilers and water heaters by optimizing heat transfer and extending the useful life of the equipment. Reducing water-side fouling can result in a 2 percent increase in boiler energy efficiency.